A lot happened at the end of Season 6, so here’s a tweet-sized recap: The Sept went boom. Tommen went splat. Jon rose. Dany sailed. Arya sliced. Or, you could do what the show’s “Previously on” did, and pull some deep cuts from Season 1. Daenerys wants to return to Westeros? Well, I never! Anyway. We back, and we back, and we back! 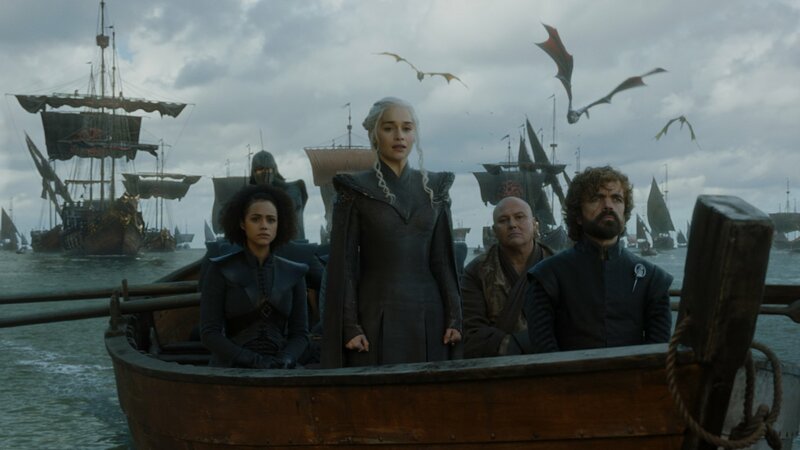 “Dragonstone,” while your usual early season table-setter, wasn’t without its thrills, and the faster pace allowed us to check in with nearly every major character within the hour. It helps, of course, that “Winds of Winter” killed off a good chunk of the cast, so zipping from points A through G was actually more feasible than it’s been in many a year. And it didn’t feel like it was rushing, either. I’m grateful that a number of these scenes had a chance to breathe, like the Hound at the farmhouse, or Arya with Ed Sheeran’s Good Time Lannister Band Solution. Just take a moment to bask in the glory of Game of Thrones, the biggest show on television and the last vestige of “monoculture,” spending valuable real estate on an extended poop montage that could have easily been set to Benny Hill. Truly, we’re in a new Golden Age. I suppose we should begin where the episode did, at The Twins. The cold open is a fun bit of misdirection, though it was obvious the moment “Walder Frey” began serving up some strangely red Arbor Gold, highlighted in loving closeup by director Jeremy Podeswa, that there was something else afoot. For Arya, relieving the eldest Frey of his spiteful life was never going to be enough — not when she can then gather the rest of his numerous relations in one room and finish them off in unison, consigning them to the same dumpster as the Raines of Castamere. At the least, it’s a final curtain call for the great David Bradley. Some Rockapella could really liven this scene up. Cersei is still Item 1 on Arya’s hit list, but the Queen has long forgotten about the youngest Stark daughter. She’s already got more enemies than she knows what to do with, and illustrates the point with a new room-sized Westeros floor map — the second-most difficult after Africa, as everyone knows. Everything the light touches is her Queendom, or so she believes. But with Dragons coming from the east, the Starks in the North, the Tyrells in the West, and Dorne in the South, the Lannisters are so behind the eight ball no one’s even going to pretend to be their friend. “We’re surrounded by traitors,” she whines to Jamie, who’s been pretty quiet since his return to King’s Landing. “Are you afraid of me?” she asks. A pause. “Should I be?” Yes, you should. Come on, man. Cersei of course doesn’t want to talk about Tommen, who she says “betrayed” them — painting over six seasons of maternal rationalizing in one stroke. “We’re the last of us,” Jamie replies. “We look like the losing side.” He’s not about to go lead an army with winter here and Highgarden hogging all the grain. They need allies, and good ones, and fast. So enter Euron Greyjoy, last seen sputtering on Pyke after Theon and Yara made off with half his armada. His new ship is so decked-out he’s clearly compensating for something, but he hasn’t lost his swagger. Spurned by the Dragon Queen? No big deal, he can find another. 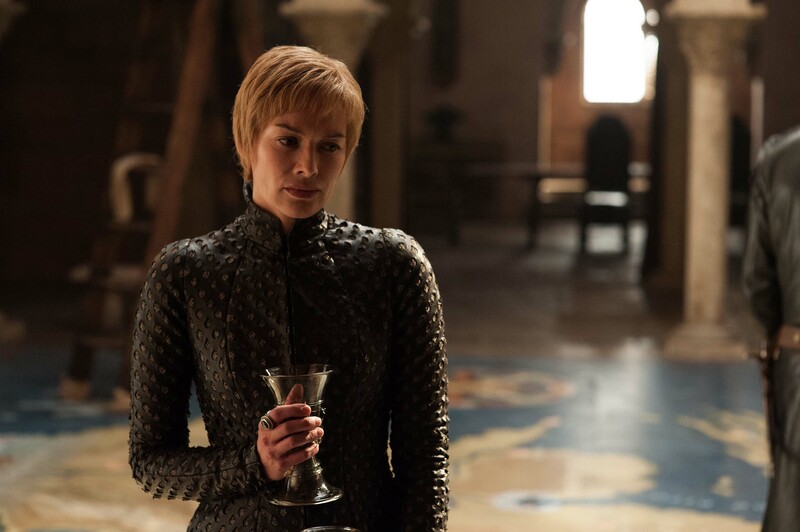 “Here I am,” he proclaims to Cersei, “with a thousand ships…and two good hands.” The look Jamie gives him in response could melt steel, but he didn’t need to worry, as Cersei declines his first offer of marriage. Undeterred, Euron vows to return with “a gift of great value.” Maybe her little brother’s head on a platter? There’s still a great deal of time acceleration, and we should expect that that’s the new normal as we rush headlong toward the finish, a scant 12 episodes from now. Cersei’s also had time to send a raven to Jon demanding fealty, which he plans to ignore. There are a thousand miles between King’s Landing and Winterfell, and Jon doesn’t give a crap about what’s happening in the South with the Night King on his way. Sansa warns him, however, not to underestimate Cersei. “I learned a great deal from her,” she admits. And Sansa has been increasingly vocal, even disagreeing with him in public about what to do with the lands of the Umbers and Karstarks — she says to give them to new, loyal families; Jon responds by asking Ned “SmallestJon” Umber and a young Karstark woman to re-pledge. You know, the sensible thing. “I will not punish the son for his father’s sins,” says Jon. It wins over the crowd, because no one wants to see Jon repeat big brother Robb’s mistake. Sansa recognizes this, and, in between rounds of giving Littlefinger the brush-off, admits Jon’s pretty good at the whole “ruling” thing — provided he continues to make smarter decisions than their late father and brother. (Excepting, I suppose, how he Leeroy Jenkins’d the Battle of the Bastards.) And he’s still got Lyanna Mormont, which is no small thing. She’s quickly become the rock and the hard place for the army of the North. When dumb Lord Glover takes umbrage at Jon calling on women to help fight, she sasses back: “I don’t need your permission.” Look, Benioff & Weiss, I don’t care who survives to the end of the series, as long as it includes Lyanna Mormont. I’m warning you quite strongly. Jon’s making other decisions as well, like sending Tormund and his crew to man Eastwatch-By-the-Sea, the castle most likely in the way of the Night King’s army of zombies. They’re coming closer by the day, an unending wave of skeletons and giants (no Hodor, THANK THE SEVEN). The Night’s Watch knows they’re coming. Bran knows they’re coming, and uses that knowledge to win entry to Castle Black, still held by Dolorous Edd and probably not enough men to field a baseball team. Where is Bran off to next, I wonder? Are we due for another Stark reunion? The Brotherhood Without Banners knows the Night King is coming, too. Thoros can see it in his flames. And now, surprisingly, so can the Hound. They’ve all been heading into the storm, presumably for quite some time, with Clegane complaining all the way. But he doesn’t hate Beric and Thoros (he doesn’t like them either, but he doesn’t hate them), and he has his share of regrets to redress, so he’s stuck around as they push their way north of the Neck. It’s now covered in snow. They reach the farmhouse where he and Arya once took advantage of a farmer’s hospitality, stealing his silver and leaving the man and his daughter to starve. But that was a different Clegane, before he nearly died, and before Ian McShane gave him honest work, and before the Brotherhood gave him a new purpose. No one can answer the question of why Beric is so special, why he gets to come back to life every time Thoros asks when better men have simply stayed dead. “Just my luck I end up with a band of fire worshippers,” the Hound grumbles. But when he stares directly into his greatest fear and sees ice, one thing becomes clear: the Lord of Light works in mysterious ways. It’s a small atonement to give the corpses in the corner a proper burial (*cough* Gravedigger *cough*), but nonetheless significant. The world of this show can be awful and cruel. But the mini-arcs of redemption — Clegane, Theon, even Melisandre — are what I find most rewarding. Far to the south, away from all the rest of the week’s action, Samwell Tarly is having a miserable time. Sure, he gets to work in the dopest library in Westeros, but the drudgery of sorting and filing — not to mention serving food to the old Maesters and later emptying their bedpans, a similarity in material that Podeswa is only too gleeful to highlight — is starting to drive him a bit mad. Worst of all, everything he needs to help Jon is locked away in the Restricted Section. He tries to get help from Professor Slughorn Archmaester Ebrose, but no dice. The man dries the organs off his hands and shrugs off Sam’s White Walker story. Not that he doubts it happened — Sam seems honest enough — but that it actually matters. Men, he says, have always thought the end was coming. But dynasties come and go, and winter never lasts forever. (Who cares about the broken ice shelf the size of Delaware, the planet’s climate is just on a cycle!) He even leans into the camera for good measure: “The wall has stood through it all.” Hmm. You guys might want to put a pin in that, because I don’t think Benioff and Weiss could foreshadow that any harder. Dragons on dragons on dragons on dragons! There’s more than just obsidian in Dragonstone, of course. It’s got big carved dragon heads, stunning views of the sea, remnants of Baratheon heraldry — quite the page on Realtor.com. But no people, at least until Dany sets foot on the shore of Westeros for the first time since she was a little girl. The final sequence of the episode, the one that gives it its name, plays out without a word of dialogue until the final moment; the camera simply lingers on the sand, the landscape, the castle, the empty hallways, and Daenerys, taking it all in. Ramin Djawadi’s score thunders as she touches down on the land of her birth, crescendoing again as she caresses the Stannis Memorial Sexytime Painted Table. She’s waited her entire life for this moment. We’ve waited seven years. We’ve all been through a lot. “Shall we begin?” I thought you’d never ask! Next week: Yara and Ellaria get friendly. Littlefinger makes yet another enemy. And…was that a certain long-lost direwolf?